Bernie Sanders leads Hillary Clinton in New Hampshire poll, gaining nationally. 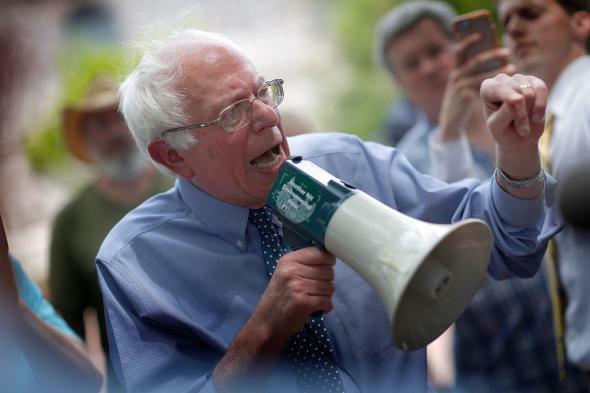 Bernie Sanders speaks to an overflow crowd through a megaphone after a campaign event at the New England College May 27, 2015 in Concord, New Hampshire. New poll numbers out Tuesday show that Democratic primary voters are taking Bernie Sanders more and more seriously by the day. No longer considered a Clinton pace car, but a potential nominee, in New Hampshire a new CNN/WMUR poll shows the Vermont senator has extended what was previously a slim lead over Hillary Clinton to a whopping 27 points. In the poll, taken largely before last weekend’s debate, 60 percent of likely primary voters said they supported Sanders and 33 percent backed Clinton. This time last year, Clinton was posting 40-point leads in the Granite State. The CNN numbers show a far wider spread than other surveys in the state, but New Hampshire voters have been trending Sanders’ way in the final weeks before the Feb. 9 primary—with Sanders registering a lead in six of the seven New Hampshire polls taken so far in 2016. The CNN poll also shows astonishingly high favorability ratings—91 percent—for the senator from the state next door. Sanders has gotten an assist in the New Hampshire race from voting rules that allow independents and registered Republicans to crossover and vote in the Democratic primary. Another national poll by Monmouth University released on Tuesday shows Clinton still far ahead—52 percent to 37 percent—in a hypothetical national contest, but that 15-point gap has narrowed significantly from the 35-point lead Clinton registered a month ago in a similar poll. Clinton still holds a slight lead in polls of Iowa voters, but Sanders’ momentum has raised the possibility that the one-time afterthought could swipe both bellwether contests in Iowa and New Hampshire. If you’re wondering what that might do to the race, Slate’s Josh Voorhees waded into that brave, new (hypothetical) world where Sanders won both contests.